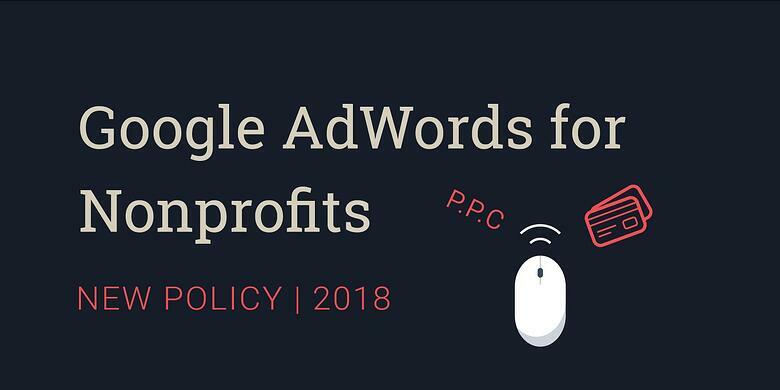 Google has updated its Ad Grant policy for nonprofits who use their AdWords program. Starting January 1st 2018, current nonprofits with the grant who don't follow Google's new guidelines for two consecutive months will have their accounts deactivated. A little background on the grant for those who don't know: This generous grant offers up to $10,000 per month in free advertising money. You can learn more in our Google Ad Grants announcement from a couple years back and get tips on how to maximize your grant on The Nerdy Nonprofit. The most urgent update to note is that instead of requiring a minimum of a one percent click-through rate, Google is boosting this up to five percent. We learned of this list of updates in Search Engine Land, NPQ and Google provides there updates and resources here. Google reported that 5 percent is actually lower than the average CTR for nonprofits, so this shouldn't be too daunting. Likewise, by following new updates to their policy, nonprofits will remove low-quality keywords and avoid competitor keywords which will improve the CTR. In the end, it encourages nonprofits to invest a bit more time in this tool and as a result, benefit from higher-quality users getting to your nonprofit's digital resources. The update also helps nonprofits who can't afford the $2.00 CPC cap as "keywords have skyrocketed given the need for companies to focus on improving paid search traffic and SEO" (Nonprofit Quarterly). Ginny Marvin of Search Engine Land believes this change stems from Google wanting to encourage non-nonprofits to use AdWords Express. She also reports AdWords Express is meant to be an option for nonprofits that don't have the ability to manage their accounts. How can you get your CTR up to 5%? How do you know if your account is in danger of suspension? Accounts that are at risk of following below the new threshold will get an alert in their Google AdWords account. Google will also send resources for how to improve your current efforts. Disactivated accounts can always call Google Support to renew their account. However, don't call without making the proper updates to your account beforehand or they will just ask you to do so. At ArcStone, we've worked with several nonprofits and their Ad Grant. Please reach out if you need help and we'll point you to the right resources. Otherwise, Google's offering webinars and tips as well as supports a community forum for further help and support. Want to stay in the nonprofit know?